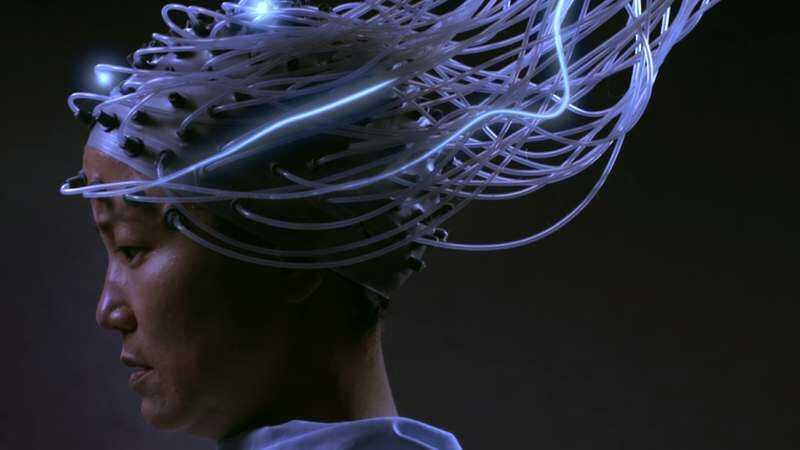 The science-fiction film Advantageous takes place in an unspecified but not distant-looking future, rendered in washed-out digital video—an Upstream Color palette with splashes of low-budget but well-deployed visual effects. Those effects primarily function as an extension of the film’s setting and set design, adding in distant explosions and drone-like flying machines that Gwen (Jacqueline Kim), the film’s lead character, never encounters directly. As in a lot of good sci-fi, the movie is set in a particular world, but driven by the characters that inhabit it. This intentionally stilted affect can turn a little narcotizing, especially during the movie’s protracted midsection, when Gwen agonizes over difficult decisions after losing her job at the Center. She searches for a new one via an unseen network that sounds, based on its aggressive vocal prompts, like a LinkedIn gone mad with power. Phang makes smart use of a presumably low budget by introducing tech so integrated into life that it doesn’t need to look ostentatiously futuristic. Advantageous, while too wan-looking to qualify as beautiful, has an otherworldly aura floating over its many recognizable sights. Harder sci-fi eventually turns up when Gwen is forced to consider a drastic procedure to give her a much-needed edge in her fuzzily defined work—and one that will alter her relationship with Jules. The mother-daughter relationship is central to the movie, to the point where some scenes addressing familial melodrama (involving a nicely restrained Ken Jeong) feel diminished simply because they can’t include the empathetic younger actress. In general, Advantageous underpopulates its vision—the unanswered question of where the unproductive, non-elite people have gone feels more logistical than philosophical. But the film feels less small when it comes to the ways Phang challenges the sci-fi (and indie-movie) status quo: using a predominantly Asian-American cast to tell a story about vanishing underclasses and the attempt to turn the promise of youthful exceptionalism into a dodgy renewable resource. That second part is vital to the movie’s low-key effectiveness. When Gwen calls herself a “very satisfied test subject,” it’s chilling as both a piece of speculative fiction and in its eerie plausibility.